My favorite Canadians, Sloan, are set to release their eighth album on September 19 and earlier in the week Stereogum posted about the first single, "Who Taught You to Live Like That?," being available on the band's MySpace page. Today, Chromewaves reported that the album is 29 songs long (!) with equal contributions from all four members. Never ones to shy away from self-deprecating humor, the album is called Never Hear the End of It. Sloan's last album, 2003's Action Pact, seemed like a obvious stab at the charts, with a de rigeur overly-compressed digital sheen and way too many negligible pop-punk songs from Patrick Pentland, and none from drummer Andrew Scott. Keeping it from being a sad suckfest were resident ham Chris Murphy and his melodic skills, Keith Moon imitations and corny/clever lyrics; and the two contributions from vinyl freak Jay Ferguson -- the best on the album. For a while it looked like Action Pact would be their last, but when the boys played Bowery Ballroom last year in support of their singles comp A Sides Win, Chris Murphy said the band were already working on their next album... and obviously they weren't kidding. The very Bolan-esque "Who Taught You to Live Like That?" is the first Jay-penned Sloan single since "The Lines You Amend" ten years ago (and technically that was Jay/Chris). It may not be the strongest Sloan song ever, but it sounds like a real band playing, not something pieced together on a computer. I can't wait to hear the other 28. 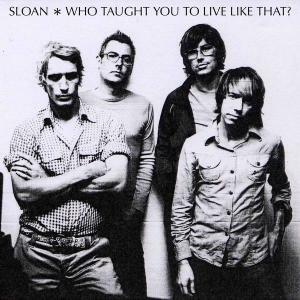 MP3: Sloan - "Who Taught You to Live Like That?" My favorite Sloan video: "People of the Sky"